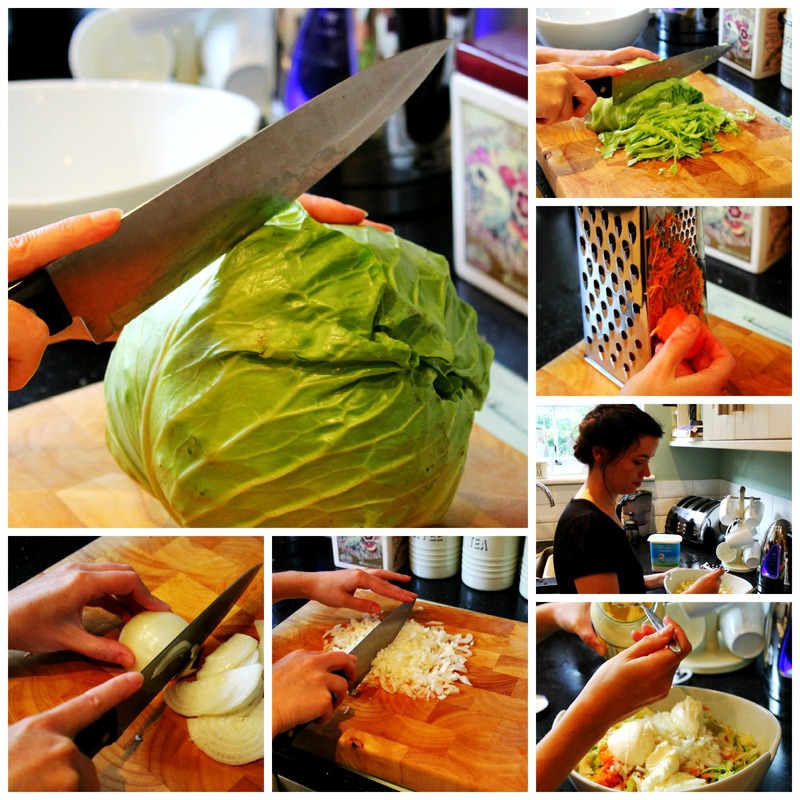 After heading home from the allotment on Sunday, proudly holding aloft our first harvested vegetable of the year (one of our Ballhead Cabbages which we planted at the end of March), I was keen to get into the kitchen and start chopping right away. A brassica massacre, if you will. It just so happened that I had a bag of carrots languishing at the bottom of the fridge, so I wasted no time in turning the first fruit of Ade’s labours into a delicious, crunchy coleslaw. Homemade coleslaw is a world apart from the limp, gloopy monstrosity you buy in tubs from the supermarket, and the version I make is lighter and probably healthier than most; rather than smothering it entirely in mayonnaise, I use equal amounts of mayonnaise and natural yoghurt. I also add a teaspoon of Dijon mustard which gives it a nice little kick. I don’t have a food processor, so the cabbage and onion I cut finely by hand, and the carrot I grate. In terms of quantities, I usually just improvise and judge everything by eye and by taste. But for the benefit of you, dear readers, I have jotted down how much of everything I used on this occasion. Feel free to adjust, embellish and improve! 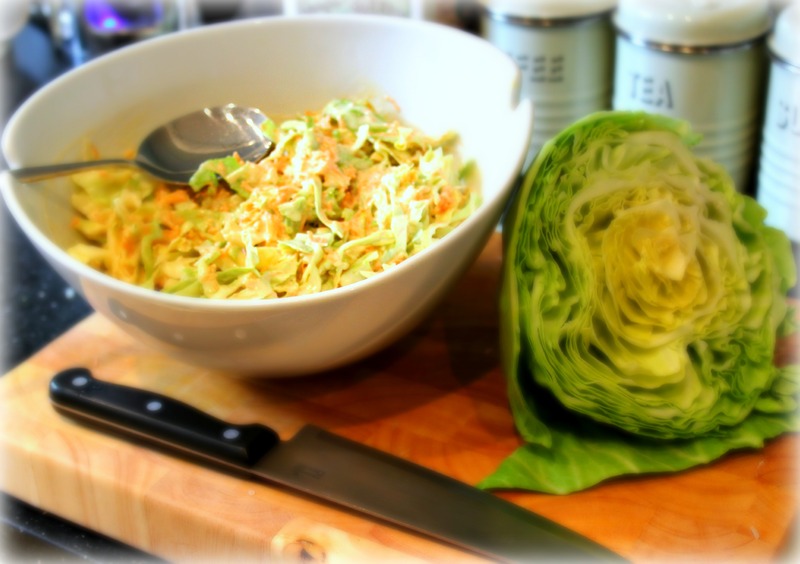 Mix the shredded cabbage, carrots and onion in a large bowl. Mix the mayonnaise, yoghurt and mustard together in a small bowl before stirring it into the vegetables. Add salt and pepper to taste before giving everything a thorough stir so the vegetables are evenly coated in the dressing and seasoning. This will make a hefty bowlful which should certainly feed a crowd. Ade and I keep it in the fridge for a few days and use it for our lunches at work; a small bowlful of this mixed with a half a tin of tuna and some cherry tomatoes makes for a cracking packed lunch.